KC Royals, Sporting KC, Kansas City Chiefs, Kansas Speedway, Sprint Center and more! Simply fill out our online form to reserve your place in our schedule! Form may not work in Safari or other browsers. For your game day ride we offer Black Car Services in Kansas City. KCI Chauffeur is the premiere Car Service provider in the Kansas City area. KCI Chauffeur has a ride to fit your needs. We offer professional chauffeur driven Sedans or SUV that have all the amenities and services you expect. We provide KCI airport pickup, total transportation for meetings, conventions, corporate events and game day transportation to Chiefs Stadium, Royals Stadium, Legends and Sporting KC in addition to private parties and special occasions. Select one of the links above to learn more about the services and options available. Four KC superfans take us under their wings and give insider information on tailgating at Arrowhead. 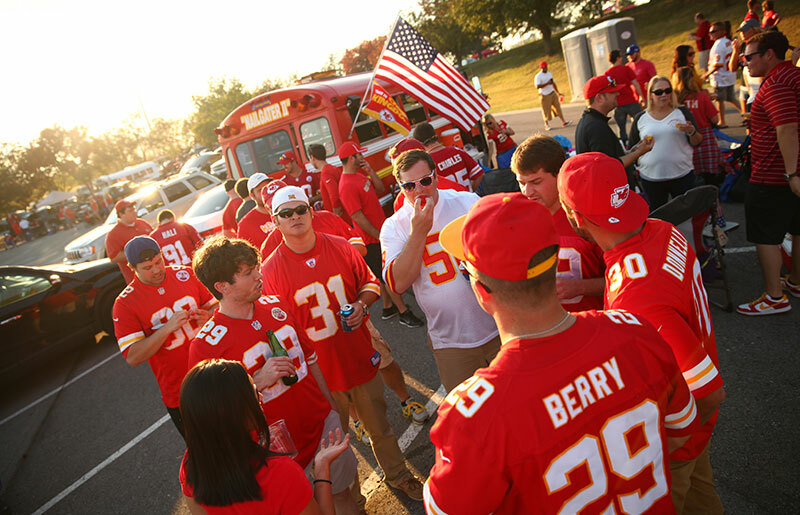 Ever been tailgating at Arrowhead Stadium? The fact that you may or may not like football has nothing to do with this question. It has nothing to do with the possibility that the Kansas City Chiefs aren’t your hometown team. Tailgating at Arrowhead is a bucket list item analogous to the experience of seeing the Cubs play at Wrigley. It’s not about sports; it’s about a cultural experience, and one that will glow brightly in participants’ memories till the point at which six feet of terra firma permanently snuffs out the light. 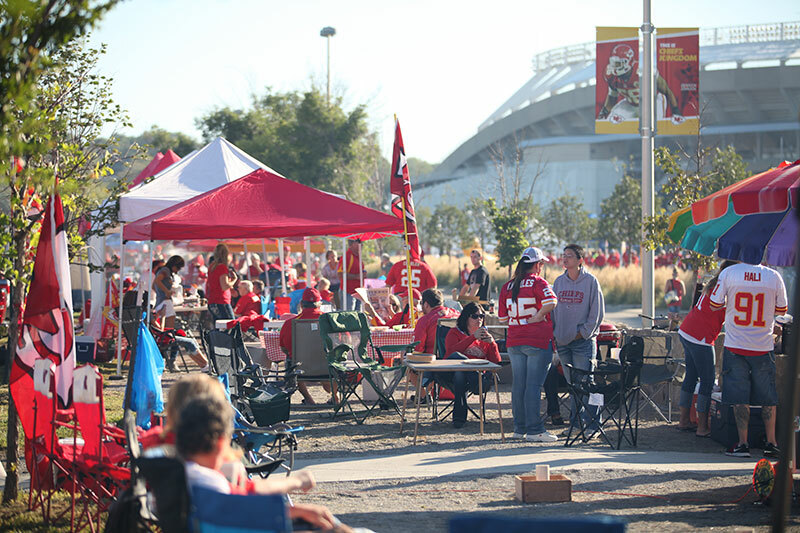 The act of tailgating isn’t unique to Arrowhead. But the turnout, and the passion with which Kansas City tailgaters execute this football tradition, are unique—so much so that Arrowhead tailgate parties attract participants from around the nation. You’ll find football fans, of course. But you’ll also find Indiana Jones types—casual anthropologists who inhale the atmosphere as if a bee feeding on pollen. Trailers are permitted but will be charged for an extra parking space and must park in the grass. RVs and motorhomes need to enter the sports complex through gate 6. 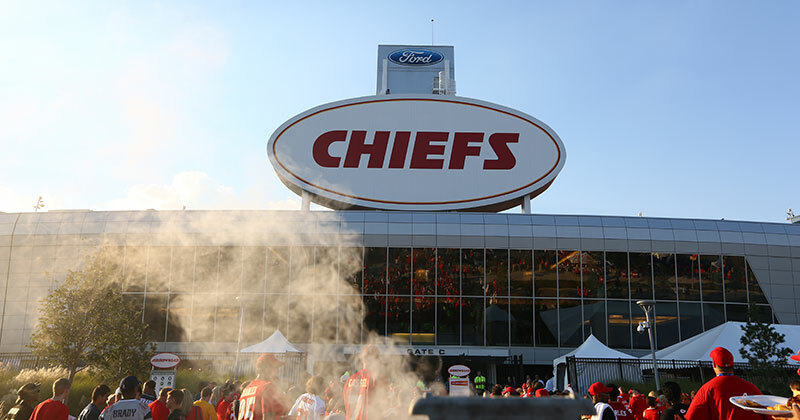 Recently, I spoke with four Chiefs tailgaters—professional athletes in their own right—each of whom have at least a decade of tailgating experience at Arrowhead. My question was simple: What do I need to know in order to max out my tailgating experience at Arrowhead? The answers flowed like Bud Light. Ty Rowton has been a “superfan” since 1992; since 2000, he’s called himself “X Factor”, and he has the tights to back it up. He says serious tailgaters need to arrive early. Gates swing open three and a half hours before the start of the game, and as games typically begin at noon, 8:30 A.M. would mark the beginning of Arrowhead tailgate time. But 8:30 is too late for Ty. He arrives at 6. For David, tailgating is all about the food—and we’re not talking hot dogs. He saves such pedestrian offerings for pre-season games. (Tailgaters need to warm up too, apparently.) But once the season starts, so too does the decadence. Bacon is like currency is Arrowhead. Beautiful, edible currency. 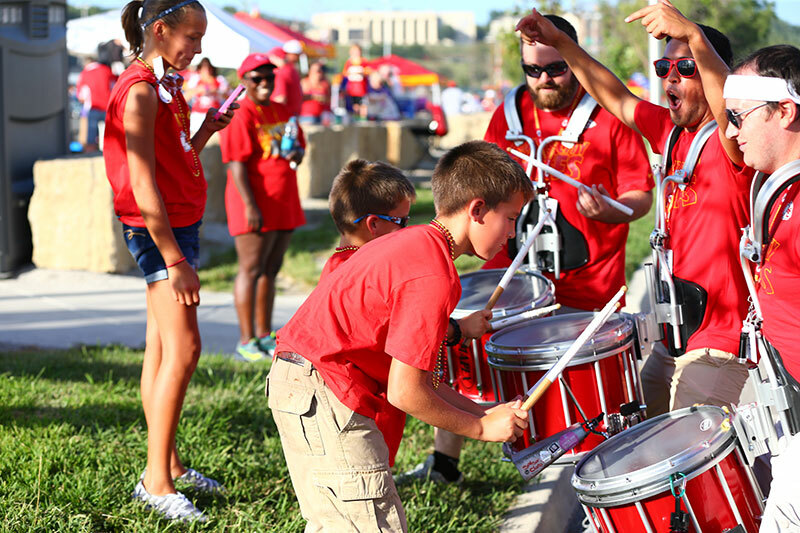 Not sure what to talk about while at a Chiefs tailgate party? Talk about bacon. Want to gain access into someone else’s party? Tote around a packet of bacon and a sixer of Bud. Preferably, wrapped in bacon. But as important as bacon is to the tailgating culture of Arrowhead, barbecue is what holds court. The tailgate landscape at Arrowhead is as wide and varied as are varieties of barbecue sauce in Kansas City. That being the case, where should one go once inside these pearly gates of wonder? Don’t dance? Claude Chafin, who’s in his 20th season of tailgating, recommends visiting the chili contest, likely happening in the hours before the Oct. 2 game. All four tailgaters agree that the best tailgate parties happen during visits from the Chiefs biggest rivals, Oakland and Denver. David also says that tailgating parties in advance of Monday night games are noteworthy. 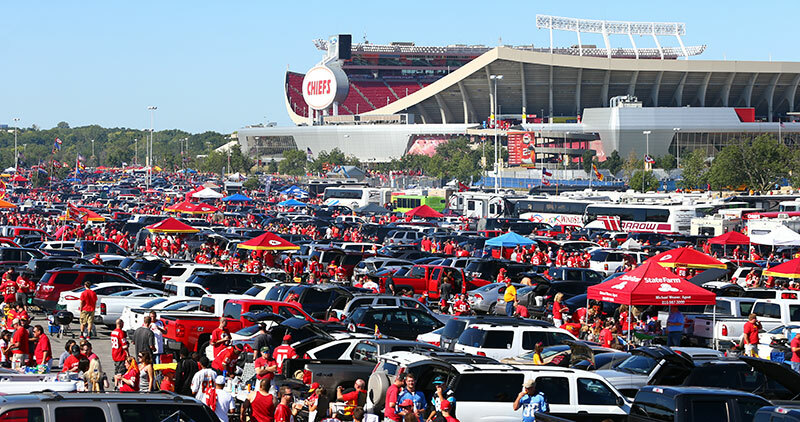 And that brings us to another salient point: There is no such thing as too much tailgating at Arrowhead. Take an Advil and stop your whining! But with tens of thousands of fans at each outing, the experience can be intimidating, especially for first timers. That’s why David offers to hold our hands. Call him the Fairy Godmother of Tailgating. Or, more aptly, call him a typical Kansas City tailgater—one of thousands of selfless fans who want nothing more than to share the experience. Which is fittingly emblematic of the experience itself. Look up David on Facebook under “Chiefs Tailgaters”. 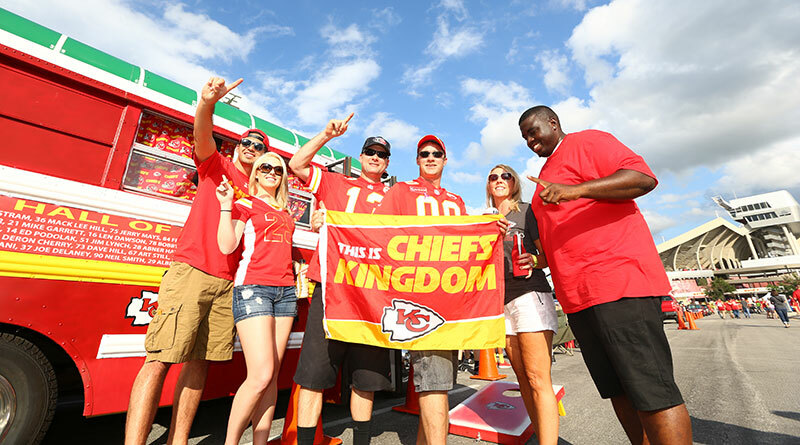 Then find out more about tailgating by visiting the Chiefs’ official tailgating page.